Believe it or not, you're going to need an iron in college. Whether it's to go to an interview for an internship or on campus job, for a presentation that you need to give in class, or a networking event, you will need to have clothes that look professional. You can easily take care of this with our Steam, Dry Spray Iron - Red, which is one dorm supply that is sure to come in handy throughout the school year. Plus, in a cool red color, it will add some fun to your dorm essentials. 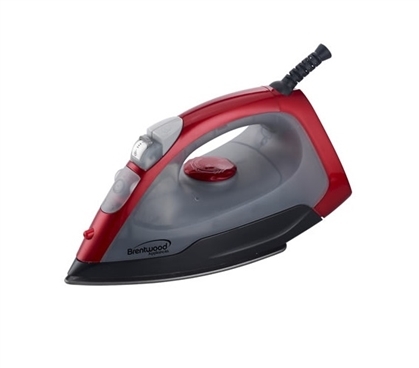 Our Steam, Dry Spray Iron - Red has a non-stick soleplate and adjustable heat setting so you can be sure not to ruin your clothing by using a setting that is too hot. In addition, it has steam, dry, and spray features so you can keep your clothes looking great. An iron is a dorm essentials item that can often go overlooked when you're adding dorm items to your college dorm checklist. However, this is a dorm item that you don't want to forget - you'll find yourself forgetting clothes in the dryer often and with our Steam, Dry Spray Iron, you can banish those wrinkles in your clothes instantly.